The University of St. Thomas has launched an interactive multimedia version of an existing fine arts course, Music Literature. The Center for Multimedia Development and the instructor redesigned the course to take advantage of new media. This paper describes the process they undertook, demonstrates some of the new media materials and presents results from implementation. The Center for Multimedia Development at the University of St. Thomas recognizes that in order to provide meaningful learning in new media, it is necessary first to identify effective instructional strategies that actively engage the learner and then design appropriate courseware for that media. This spring, the Center launched an interactive multimedia version of an existing fine arts course, Music Literature. This course is intended for the non-musician and uses an historical lecture and critical listening pedagogy typical of most music appreciation classes found on college campuses across America. The re-worked version of the course is intended for the "non-traditional," adult learner. Although the course in the past has been taught in a lecture format, we analyzed the course objectives and opened the palette of methodologies to include technology-based solutions where appropriate. Fully half of the class sessions have been dropped; material not covered in the classroom is delivered on the Web and from CD-ROM. determining what degree of completion would be satisfactory. Using the list as a foundation, the designer and faculty member took a fresh look at the objectives with an eye toward meeting them with a larger variety of media. At this point, no approach to teaching the students was considered off limits as we deliberated whether it was most effective to deliver information via video, audio, CD-ROM and the web or through paper and face-to-face communication. An existing text was chosen from a field of dozens of possibilities because, among other important criteria, the text included a coordinated audio CD anthology. Special attention was given to objectives that called for hands-on work. Music, an inherently hands-on discipline, demands some level of interactivity. However, composition, an aspect of music open to everyone regardless of background, is rarely covered adequately because it takes up too much time. Thus, we decided to use technology-enhanced interaction with creative musical elements to solve this problem. Once a preliminary list of materials was generated, the project manager, the designer, and faculty member met to review their work. Technology-based materials are expensive to produce, and thus it was important to use our limited resources on those materials that provided experiences not available through lower-cost means. It would not make sense to develop page turning exercises that merely reiterated concepts and examples available in a text. A rough resource estimate was made and the list of materials was finalized. Once the content with associated materials and methods was organized into a syllabus, a development schedule was established. The faculty member, instructional designers, a programmer and an art director participated in designing all computer-based and Internet materials. A common look and feel for the materials was developed that detailed options available at various screens and other interface considerations. For the multimedia exercises (see Technology Components) we used an instructional approach that provided both exploratory and self-test activities. In order to expand upon rather than duplicate material found elsewhere, a decision was made to use original compositions done by Dr. Kachian. This also meant that we could avoid possible copyright problems. Student workers do most of the programming for our projects, so the designs would be geared toward implementation in an authoring system. The team created a design document for each piece. The design document contained flow charts and narrative to describe how the student would move through the program, illustrated with storyboards that depicted each screen, including the options available. These designs were distributed to the production staff and testing coordinator. The art director and audio producer developed a list of assets for each piece. A team of graphic artists utilized clip art and original artwork to create their assets(i.e., components that would be integrated into the program). Audio engineers, working in a MIDI studio and with desktop audio editing software, created the audio assets. The programming staff used the design documents to build the structure of the programs, then inserted assets as they became available. During production, changes were often made to the design for aesthetic, technical, or interface reasons. Any time a change was made, the designer created a design document revision and distributed it to all parties. As the programmer finished each piece, the faculty member reviewed it for content accuracy. A variety of modifications were made, ranging from text changes to graphic changes to programming changes involving judging algorithms to the replacement of compositions. Once the content experts signed off on the programs, they were ready for testing. As each design was finished, a member of the university's computing staff developed a test plan so that all areas of each program would be tested for functionality without going to the level of stress testing. (Stress testing involves testing extreme conditions, e.g., running all of the program on the computer at the same time.) . In addition to the computers available in our center and in the student computing labs on campus, a testing lab was furnished by computer services that contained lower-end machines with modem connections. As testers moved through the test plans, they were instructed to identify incidents or places where the program either did not act as specified or where more serious problems occurred. The incidents were recorded, first via a paper form and then by means of an online report and database application. The testing coordinator reviewed the incidents and, in concert with the team, decided which merited attention and assigned them to the appropriate production staff. Once corrections were made to the software, new versions of the pieces were cut and the testing cycle resumed. The university's support staff had been involved in some of the product testing and were available to students through their help line. Materials were duplicated and distributed to all students in the course. During the first week of class, all students were introduced to the technology components. 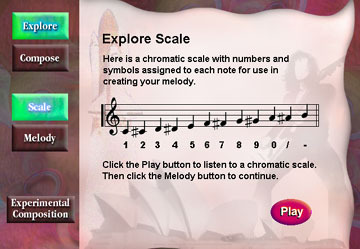 A set of six multimedia exercises, each focusing on a basic set of concepts, was developed for delivery via CD-ROM. The exercises are divided into two halves: the materials and structures of music, and a set of composition-based exercises. From the first half, for example, an exercise was designed that requires the student to construct scales in various configurations. The exercise is designed so that only the correct answer will allow the student to proceed. Other exercises invite the student to try again if an unsuccessful answer has been entered. In the composition-based second half, there is an exercise entitled Romantic Song (Figure 1). The student first explores how composers address a given piece of poetry when they are setting it to music. 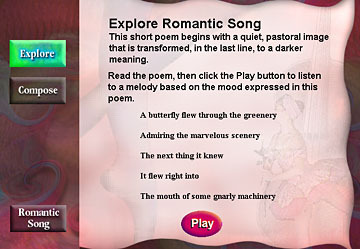 Then the student, in a self-test section, chooses from a selection of given melodic phrases and applies them to a set of poems that appear on the screen. Figure 1. A screen-shot of Romantic Song. (require Authorware Web Player plugin) A Shocked Authorware file demonstrating the Romantic Song module. (5.5MB) An executable demonstrating the Romantic Song module. Another exercise is Experimental Composition (Figure 2). The student is asked to compose an original composition using a theme based on a tone row derived from his or her phone number. In these exercises, the design permits the student to complete numerous attempts in an effort to "perfect" his or her composition. Figure 2. A screen-shot of Experimental Composition. (require Authorware Web Player plugin) A Shocked Authorware file demonstrating the Experimental Composition module. (2.6MB) An executable demonstrating the Experimental Composition module. 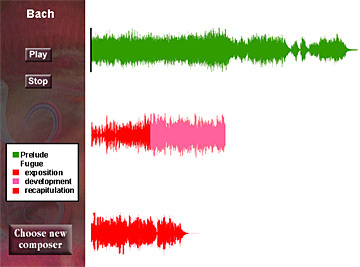 AudioGraphics (our own term for one of the developed components) is a critical listening tool that is used in conjunction with the text's accompanying CD set. Students select the assigned composition and the program displays a digitally produced graphic derived from the sound wave. The graphic is color coded to display the various formal sections of the work (Figure 3). The ability to see the music helps the student identify and understand the various styles and composers and gives the student a means of more actively participating in discussions. AudioGraphics, however, moves beyond this by providing synchronization with the audio experience. When the student presses the Play button, the audio CD (in the computer's CD drive) begins playing and a cursor moves through the graphic. Significant changes in the instrumentation are listed directly below the graphic. The student may click anywhere in the graphic to hear the composition from that point. With AudioGraphics, the student has an interactive graphic representation of the piece that facilitates analysis of such aspects as formal design, dynamics and thematic development. Figure 3. A screen-shot of AudioGraphics. (555KB; require Shockwave plugin) A Shockwave file showing the AudioGraphics of composition from various composers. One of the tools at the website is a journal. Because the site is password-protected, each student's journal can be viewed only by the student and the instructor. In addition to providing a place where the student may respond to the course content, it is also a place where students may record music criticisms that are assigned. The student may review, edit, print and delete any entries later. The instructor may review entries of any or all students. Each week of the course, the students take a multiple choice quiz within the website. Designed to be self-checks on the week's assigned reading, they are completed before the lecture and submitted for judging. Students receive quiz results electronically. Errors or missing answers are displayed so that the student can compare the correct answer with the response. The results, noting incorrect items, are also emailed to the instructor. This means that, prior to a face-to-face session, the instructor can identify troublesome concepts and spend extra time with them in class. In addition to the syllabus and the tools listed above, the website contains pages for each week, which introduce weekly lecture topics, list assignments with their due dates, and give the full syllabus. There is also a discussion forum where students may pose questions and comments for reply by other students and the instructor. Most weeks, there is an assigned topic that must be addressed via the forum. There is also a page with links to websites with information related to the content of the course and an extensive help section. The intent of this project was not to replace the teacher, textbook, testing or the communal learning environment of the classroom, but rather to create a hybrid pedagogy which would utilize technology while retaining all that is good about the group classroom dynamics.